Regardless of whether you use the Plugins SDK or your terminal to create hooks, hooks projects are stored in the Plugins SDK’s hooks directory. Assign a project name and display name. To demonstrate, we’ll use example-hook and Example for the project name and display name, respectively. Notice that upon entering example-hook as the project name, the wizard conveniently inserts Example in grayed-out text as the plugin’s default display name. 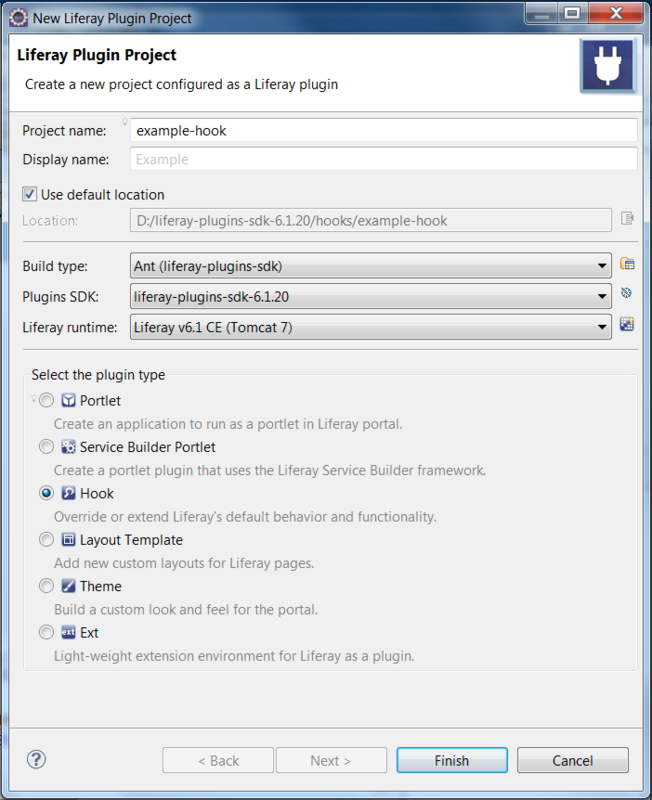 The wizard derives the default display name from the project name, starts it in upper-case, and leaves off the plugin type suffix Hook because the plugin type is automatically appended to the display name in Liferay Portal. The IDE saves the you from repetitively appending the plugin type to the display name; in fact, the IDE ignores any plugin type suffix if you happen to append it to the display name. Select the build type, Plugins SDK, and Liferay runtime. If you select the Maven build type, you’ll be prompted to enter an artifact version, group ID, and active profile for your project. See Using Liferay IDE with Maven for more information. Otherwise, select the Ant build type, a Plugins SDK and a Liferay runtime. For more information, see sections Installing the SDK and Setting Up Liferay IDE. Select the Hook Plugin Type. The Plugins SDK automatically named the hook by appending “-hook” to the project name. With Developer Studio, you can create a completely new plugin or add a new plugin to an existing plugin project. A BUILD SUCCESSFUL message from Ant tells you there’s a new folder named example-hook inside the Plugins SDK’s hooks folder. The Plugins SDK automatically named the hook by appending “-hook” to the project name. Now that you’ve created a hook, let’s go ahead and deploy it. Using Developer Studio: Click and drag your hook project onto your server. Upon deployment, your server displays messages indicating that your hook was read, registered and is now available for use. If you ever need to redeploy your plugin while in Developer Studio, right-click your plugin’s icon located underneath your server and select Redeploy. A BUILD SUCCESSFUL message indicates your hook is now being deployed. If you switch to the terminal window running Liferay, in a few seconds you should see the message “Hook for example-hook is available for use”. Note: When we created portlets and themes, they were fully functional upon deployment. Hooks aren’t like that, because they’re Liferay customizations, and the default customization is the original implementation! 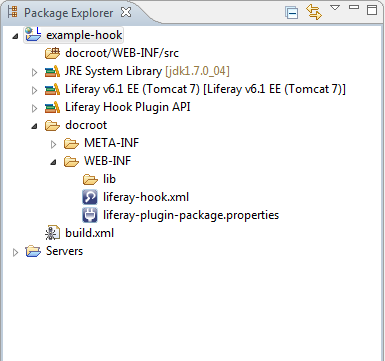 Next, let’s look at the anatomy of a Liferay hook. The particular files you’ll work on depend on what Liferay feature you’re overriding with your hook. Let’s start making hooks for the features developers override the most; web resources are a good place to start.